Bringing the boat or looking to have easy access to the water? The Alabama Gulf Coast provide days of fun in the water. You can fish, waterski, go tubing, scuba dive or just go site seeing, there are tons of things to do on the water. 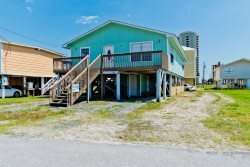 Check out our Elberta and Gulf Shores rentals with boat slips where you can access your boat right from your vacation rental. Feel free to contact us if you have any questions or special requests and we'll do our best to help make your trip as stress-free as possible!